Petmate Giant Litter Pan is the solution to provide your large cat or several cats the space they need to do their business comfortably and hygienically. Cats usually have litter box accidents due to the unhappiness of using a too small or too dirty litter box and also because they aim their butts over the edge with messy results. Additionally, when two or more cats share the litter box there is a territorial issue and one or more of them will do its business outside the litter box. Petmate Giant litter pan features high walls and built-in storage compartments to keep cleaning utensils. The litter pan is made of a very sturdy thick antibacterial plastic that holds a very good amount of litter. The shape of the pan is more rectangular, which is good because it’s not a bulky square shaped unit that could stick out too much from the wall. On the front side, it features three compartments: one big and two smaller ones. 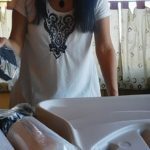 You can use the big one to put the litter and the smalls to put the scoop and the disposable bags. If you have a cat that jumps out of the litter box or a heavy digger, the scattered litter may make its way to the storage compartments. One side has a curved shape that makes it harder to clean that corner if you have a larger scoop. 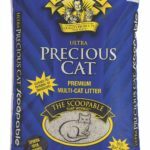 A very good litter to use with the Petmate Giant litter pan is the World’s Best Cat litter and Dr. Elsey’s Precious Cat. 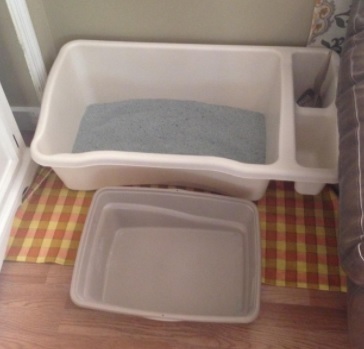 This litter box is huge, so you need to re-measure the available space to make sure the unit will fit. For deep litter, you can put easily over 30 pounds of litter, for a more moderate medium level you can make it with 15 to 20 pounds of litter, so a 40 lbs bag should last for two changes. If you have a pregnant cat, this is perfect as a bed box for the mom and kittens. The litter pan is large enough for the cat to stretch out and for the kittens to roam. At the same time, the walls are high enough to keep the kittens from falling out, until they are old enough to make it outside the litter box properly. Petmate Giant litter pan is a great solution for your large cat or if you are a multi-cat owner and you have been struggling to find a really large litter box. 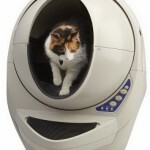 If your cat or cats have frequent litter box accidents, this unit will fix that problem. Customers state that in the beginning they were reluctant about the storage compartment becoming a poop or urine storage, but out of hundreds of customers using the Petmate Giant litter pan, none of them have had that experience. The unit is made from thick sturdy plastic so you won’t worry about the tray breaking. 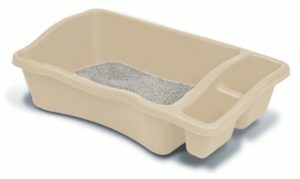 I recommend the Petmate Giant litter pan for large cats and multi-cat households with enough room to place the unit.